The micro bag filter is equipped with open & close lid, eye bolts, devit and devit arm. During cake discharge, open the lid, clean filter bags and dislodge the cake. 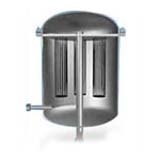 The liquid filter bags are supported by stainless steel perforated baskets.